Hammon is the NBA’s first female assistant coach and now will be the first woman to interview for a head-coaching job in the league. 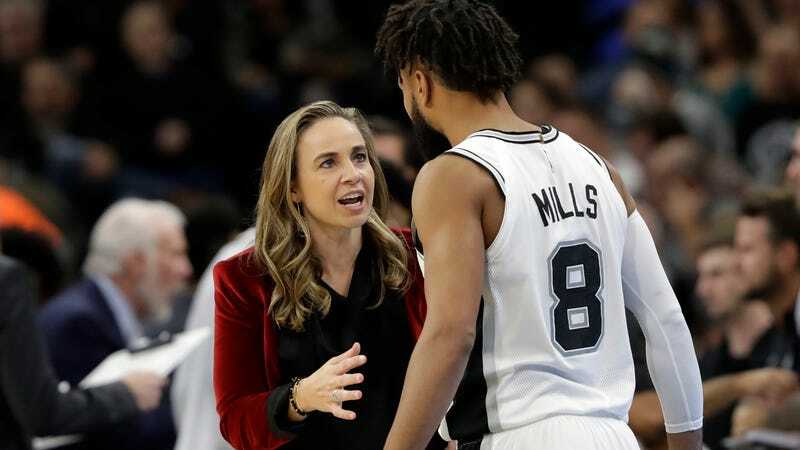 Hammon isn’t considered a frontline candidate on a Bucks list that includes at least 10 possible candidates, but Milwaukee ownership and general manager Jon Horst were intrigued enough to ask the Spurs for permission to speak with her. An assistant spot under Popovich is about as strong a resumé highlight as you can find in basketball coaching. In fact, the favorite for the Bucks job—Mike Budenholzer, who is set to move on from the Atlanta Hawks—is another candidate from out of the Popovich coaching tree; Ettore Messina, another current San Antonio assistant and the man who helmed the Spurs during Popovich’s absence in these playoffs, will reportedly also interview for the Bucks job. Plenty of assistant coaches get onto this path and never reach the end (just ask Patrick Ewing), but Hammon’s pedigree in basketball and coaching is unimpeachable, and she’s acing the same apprenticeship that once made Budenholzer—who never played professional basketball and started his coaching career as a video coordinator—a hot commodity as a rising head coach candidate. That she’s gotten this interview means the question of her someday becoming an NBA head coach should be framed in terms of when, and not if.